......and where else to start than on Bourbon St. 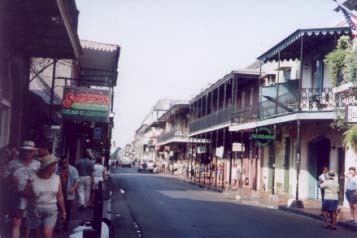 In the French Quarter. One of the musical capitals of the US. And it is all it's cranked up to be. Music spilling from every bar. Intermingled with the inevitable sleaze and tourist crap. But the music was great. Drink prices were a bit steep though. Five dollars for a coke, and a minimum of one drink per set. 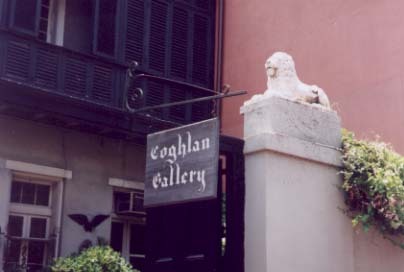 The archicture of the French Quarter is exquisite. Some of it indeed is like Adelaide (my hometown). Adelaide is sometimes described as the New Orleans of the south but I think that's stretching the point a little. Adelaide does have a number of hotels with wrought iron lattice work on the balconies like that in the picture above, but we don't have the three storey variety. 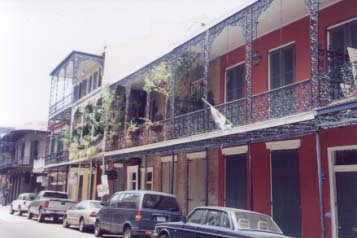 Nor do Adelaide's streets have the intimacy afforded by the narrowness of the streets in the old part of New Orleans. As for this type of architecture I've never seen it anywhere before. 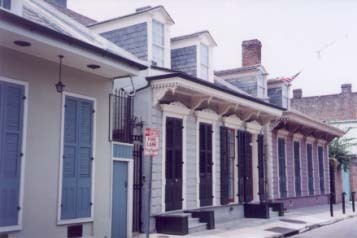 Shades of the colours of Greece on the shutters; shades of France with the extruding window boxes from the roof, but the scale of these houses is New Orleans, and the use of wood for dwellings, characteristic of so much of the United States, would nver be found in Greece or France anymore. 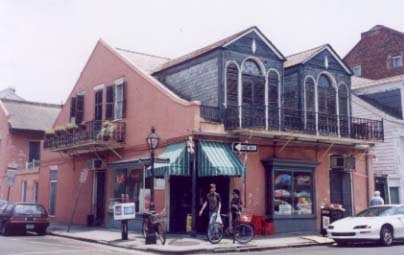 Unbelievably this quaint, dilapidated structure still houses a functioning bar down the far end of Bourbon St away from the maddening crowd of the city end. And how's this for a local corner shop? 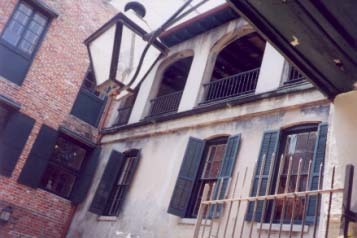 Many of the houses in the French Quarter have courtyards that are hidden away from street view. Many of these courtyards are the centre of small galleries like the one below that bears my family name.